Security forces on alert after large scale Arab rioting in Wadi Ara, near Megiddo. Security forces are on heightened alert Friday morning in the Wadi Ara region in the lower Galilee, after about 1,000 Arabs tried to block a major traffic artery there Thursday. The Arabs had gathered for a pre-planned riot, and were led by MKs Jamal Zahalka and Hanin Zouabi (both of Balad). They were demonstrating against the Praver Plan for legalizing and regulating Bedouin communities in the Negev. Police arrested 18 of the rioters, according to Voice of Israel public radio. 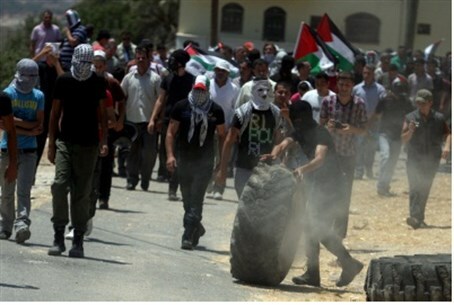 Another riot took place in the Negev at Lehavim Junction, where the Arab rioters threw rocks. Two of them were arrested. The rioting took place along Highway 65, a major traffic artery that connects Israel's central region with its northern section. The road has been a strategic passage for traders and armies for thousands of years: it leads into the Emek Yisreel (the Valley of Jezereel, or Esdraelon) at Megiddo. About 1,000 Arabs gathered along the road Thursday afternoon and chanted slogans against the Israeli government, raised Palestine and Al Qaeda flags, threw rocks and sticks, and confronted security forces. Police had learned a lesson from riots that took place just over a month ago at the same location, following the demolition of an illegal structure. This time, they were present on the scene in large forces that included Yassam special forces, and prevented the road from being blocked to traffic.